Each month, friends and I come together to swap meals we've prepared. These events are known as my "Brunch & Barter" swaps which have gotten some press recently in Pittsburgh's Post Gazette. Similar to traditional holiday cookie swaps, we apply the same concept to entrees. This makes for a fun gathering of friends who like to cook and who like to share their dishes with others. For April, we met up for brunch at one of my favorite Cuban restaurants and grocery store, La Unica. After catching up with friends and perusing the grocery section for authentic Cuban, Peruvian and Columbian ingredients, we swapped dishes that we made. I prepared the following dish, which I put together based on ingredients I had on hand. I love making fried rice/pilaf dishes because anything goes when tossed with rice in a wok. Using some shiitake mushrooms and scallions I had on hand, this was a great side dish or on its own. In a nonstick or seasoned wok, heat oil on high heat. 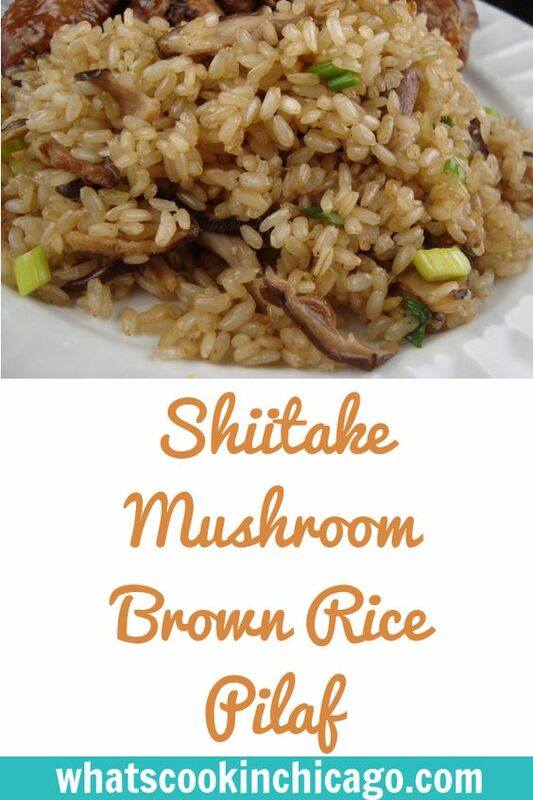 Add the garlic and mushrooms and saute for about 1 minute. Add the rice and crumble into the wok. Add the soy sauce, garlic salt and pepper to taste and stir fry the rice for about 5-7 minutes, until rice begins to warm through and slightly crisp up. Once warmed through, add the green onions and toss to combine. I served this with one of our fave Filipino dishes, chicken adobo. Great side dish! I love the flavors you combined.